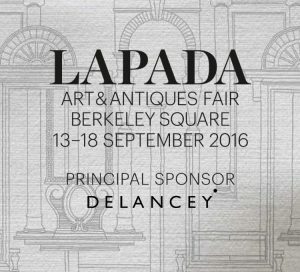 The LAPADA Art & Antiques Fair in Berkeley Square, Mayfair, London is this Autumn’s must-visit event for sourcing and buying fine art and antiques. Among the exceptional works on offer are furniture, jewellery, carpets, tapestries, antiquities, clocks, ceramics, silver and fine art. 100 exhibitors present work from across the art, antiques, design and decorative arts spectrum. Including jewellery, furniture, carpets, tapestries, antiquities, clocks, ceramics, silver and fine art, authenticity is assured thanks to a 70-member specialist committee pre-vetting everything on sale. The Fair will take place from Tuesday 13th September until Sunday 18th September 2016.